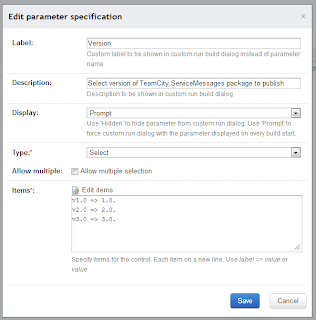 In this post I'll describe the solution I used to publish/promote builds of 3 version of TeamCity.ServiceMessages library to NuGet.org via TeamCity. I moved TeamCity.ServiceMessages builds to teamcity.jetbrains.com. There are 3 active versions of the library. It was necessary to re-use build setup in TeamCity. So I used build configuration template for it. The template contains steps to fetch NuGet dependencies, to patch assemblies version, to build Visual Studio solution, to run NUnit tests under dotCover code coverage, and to package the library as NuGet package. The template is parametrized by library version and Git branch name. 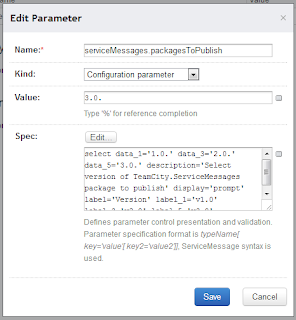 The easiest way to implement publishing is to create a build configuration for each of package versions. This would make me to copy 3 same configurations. There is another approach with help of Typed Parameters. Here I use the following *%serviceMessages.packagesToPublish%*.nupkg. 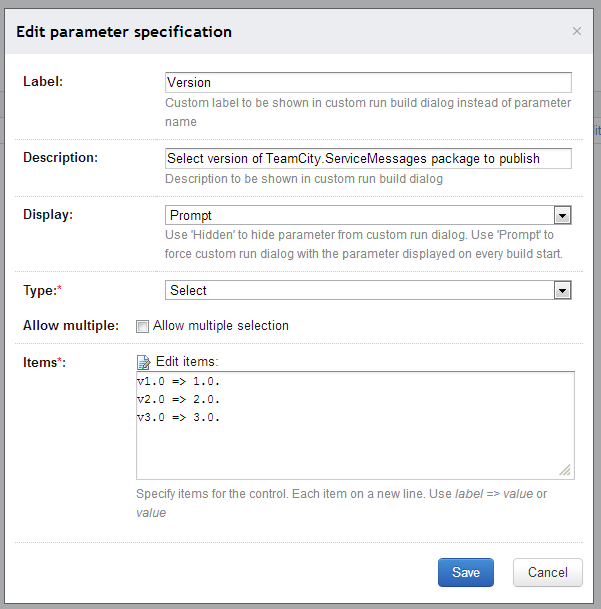 I can specify wildcard as TeamCity Property in Build Parameters section of build configuration settings. Here I use Typed Parameter to implement drop-down. I also mark parameter as required in order to make TeamCity show custom run dialog for me on every run button click. This build is started only implicitly, so I have no build triggers. I added an artifact dependency from all 3 of my build configurations. 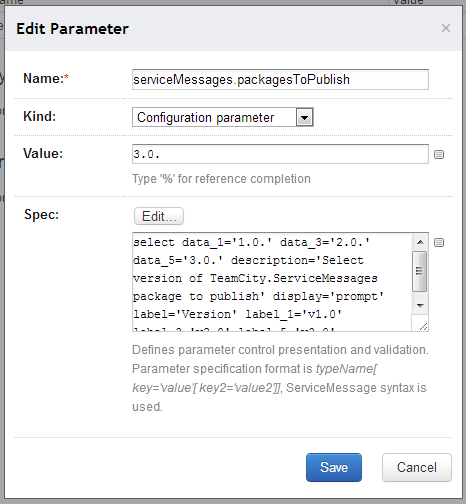 The values of %serviceMessages.packagesToPublish% are selected in the way to select only one of 3 NuGet packages. I can select the the build configuration of the library with latest successful package I want to publish with NuGet. Thanks to Dependencies tab I can override the artifact if necessary.